Hi, I'm Elly. Like many English teachers, I love coffee. Filter, drip, even at a push, instant: before I teach an evening class (or even a very hyper class of children), coffee is my best friend. Sometimes, though, my love of coffee can cause me a few problems. You know what causes students problems? Conditionals. This is how I teach them to my classes. How do I know a conditional sentence when I see one? Conditional sentences have two different parts – two clauses. One starts with 'if' and tells us about a situation. The other tells us what the result of this situation is likely to be. The two parts of the sentence can be in either order. There are four different types of conditionals. So what's the difference? We'll get to that in a minute. When looking at conditionals, there are three important factors to get your head around. Firstly, is what I'm talking about real or hypothetical? Is it something that's actually going to happen (or did happen), or is it just my wishful thinking? Second, when am I talking about? Is it in the past, now, or the future – or all of the above? Last but not least, is what I'm talking about likely to happen? Certain to happen? Or is it impossible? Got those three questions down? Great. Let's jump and look at some examples. Zero conditional = to describe a general truth. When we use zero conditional, we're talking about a general truth. What's a general truth? It's when we're talking about things like scientific facts – things that just happen. For example, if ice gets hot, it melts. If you are a vegetarian, you don't eat meat. If you go out in the rain without an umbrella, you get wet. They happen now, and they happen always. Why don't I learn? 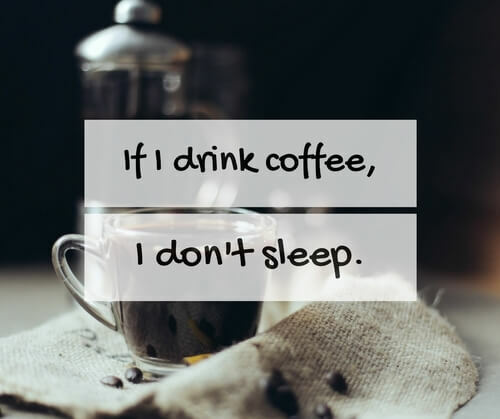 Well, when it comes to coffee I just choose to ignore the facts. In zero conditional, the verbs in both parts of the sentence are in the present simple. First conditional = to describe a real situation in the present or future. In the zero conditional sentence, we were talking about something that is always true – it doesn't matter if we're talking about today, tomorrow, or twenty years in the future. Here in the first conditional, though, notice the time marker – tonight. We're talking about something that is real again, but this time we're talking about its future result. For example, if you don't study, you won't pass your exam. If global warming continues, the planet will get warmer. If you forget your umbrella, you will get wet. These are possible, real situations. The 'if' part of these sentences talks about the present or the future. The second part of the sentence tells us what the likely future result will be. In first conditional, the verb in the 'if clause' is in present simple, and the verb in the other clause is future simple. Second Conditional = to describe a situation that is not based on fact. In the second conditional, the thing in the 'if clause' is unlikely or hypothetical. The second clause tells us what the probable future result would be. Now as I've already mentioned, I LOVE coffee, so I'm highly unlikely to ever say this sentence. Think of this sentence as being said by my highly sensible, non coffee-drinking friend, Mary. If I spoke Chinese, I would live in China. If I didn't like seafood, I wouldn't eat prawns. I'm not likely to win the lottery, or speak Chinese, or stop liking seafood. Mary isn't likely to drink coffee. These situations are hypothetical. They take place now or in a kind of general future time. They are imaginary or unlikely. In second conditional, the verb in the 'if clause' is past simple, and the verb in the other clause is 'would' + the bare infinitive (the infinitive of the verb without 'to'). The third conditional is one of the trickier ones to get your head around. Imagine I'm telling you this on Tuesday morning... and on Monday night I was really well behaved. Did I drink coffee last night? No, I didn't. Did I sleep? Yes, I did. Third conditional tells us about what didn't happen – and what the result would have been if it had happened. These sentences are completely hypothetical. Both the 'if' situation and the result are in the past. These situations are impossible – we can't change what's already happened, so they tell us the opposite of what actually did happen. In third conditional, the verb in the 'if' clause is in past perfect, and the other clause has 'would have' + past participle (the 3rd form of a verb - go; went; gone). Mixed conditionals are like the drip coffee of conditionals. They're complicated, fancy, and are sure to demonstrate that you're not just a user of conditionals... you're a connoisseur. In mixed conditional sentences, both parts of the sentence refer to two different times. Check out the time words – the 'if clause' refers to last night – the past. The other clause refers to now. Did I drink coffee last night? No, I didn't. The first part of this sentence talks about an unreal situation in the past. The second part of the sentence talks about the probable result of this situation. For example, if I'd done my homework, my teacher wouldn't be angry with me. If I'd gone to bed early, I wouldn't be late. In this type of mixed conditional, 'if' is followed by the past perfect, and the second part of the sentence is 'would' + the bare infinitive. So this mixed conditional #1 is basically third conditional + second conditional. In this type of mixed conditional, the 'if' part of the sentence describes an unreal present situation. The other part of the sentence talks about the probable, but unreal result, in the past. If I drank decaf coffee, I wouldn't have had a problem! Do I drink decaf coffee? No, I don't. This is always the case – so the 'if clause' here tells us about something that is true now, or that will continue into the future. When did I have a problem? In the past. My many, many sleepless nights with too much caffeine in my system. In this type of mixed conditional, the 'if' part of the sentence is followed by the verb in past simple, and the other part of the sentence is 'would have + past participle'. This type of sentence is what you'd get if you added second + third conditional together. Elly Setterfield is an English teacher, blogger and writer. She has taught in private language schools and primary schools in Russia, the Czech Republic and the UK, and is passionate about helping new teachers feel happier, less stressed and more confident in the classroom. When she's not teaching, she enjoys cooking, running, spending time outdoors and crochet. She blogs regularly at thebestticher.wordpress.com, and tweets @thebestticher.